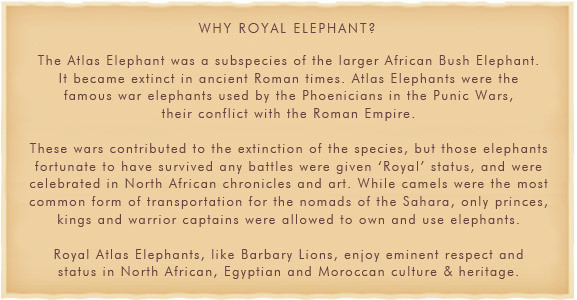 The Royal Elephant experience is shaped by a kingdom, past and present, by royal design and elemental grace, by the symbols and smells, the colours, echoes and reflections of Morocco & North Africa. This inspiration reflects in the service our guests and delegates receive from the moment they arrive in the magnificent lobby, throughout their stay in the luxurious rooms & suites; to the pleasure of the conference facilities and restaurants and bars, and the time of departure. The hotel is designed to combine the best of modern living and comforts, with the old-world charms of warm attentive hospitality and friendliness. Flanking a beautiful stretch of the Hennops River in the indigenous Highveld bush, and located at the heart of the bustling Gauteng Province, the Royal Elephant Hotel & Conference Centre is a distinctive five-star leisure retreat and conference centre. Distinctive architecture and decor provides the setting for the ultimate in privacy and intimacy, the best that event & business facilities can offer; and immerses the senses in North African delights, sounds and aromas. The Royal Elephant heralds a pioneering concept in luxury hotel & business hospitality for South Africa, featuring contemporary design, characterised by the spaciousness, warmth and understated luxury that epitomizes North-African & Moroccan living. Located near the major motorways and business centres of Gauteng, the hotel & conference centre offers convenient access to lavish accommodation, exceptional cuisine, and a diversity of event & meeting options. And the exclusive features and facilities respond to the unsurpassed location and climate to provide the ultimate leisure & business experience.